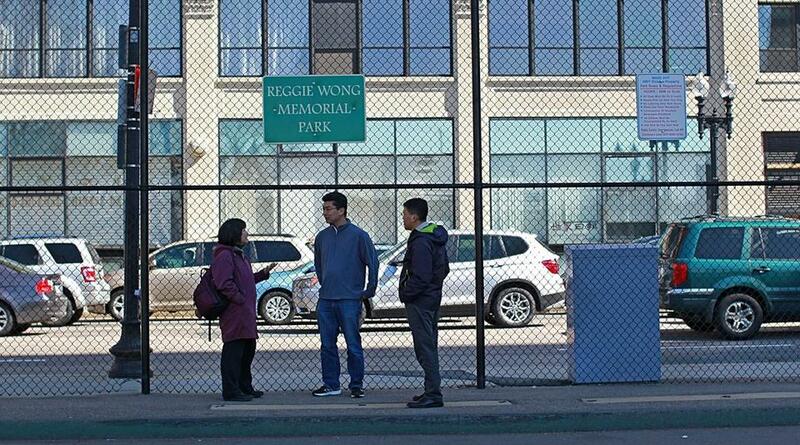 Lydia Lowe, codirector of the Chinese Progressive Association in Chinatown, Russell Eng, a volleyball coach, and former resident Wesley Wong are concerned about the park. A new study of Boston residents who live or spend a significant amount of time near Interstate 93 and the Massachusetts Turnpike has found that their exposure to microscopic metals and chemicals spewed from vehicles increases their chances of suffering a heart attack or stroke. 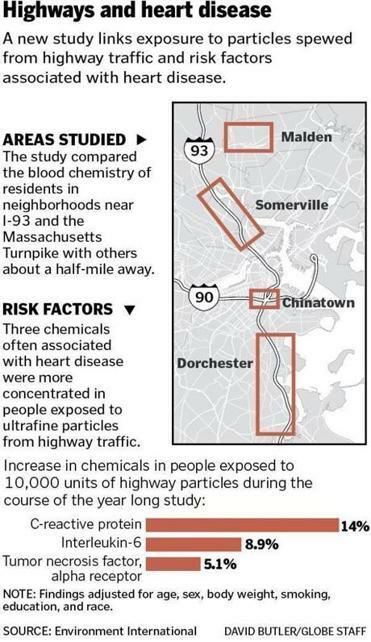 The study of so-called ultrafine particles, which expands on previous public health research in Somerville, adds to the growing body of evidence of the dangers of living near highways and other busy roads. The findings suggest that those who live within 1,500 feet of a highway have a greater likelihood of developing cardiovascular disease than those living twice as far away. More than 45 million Americans live within 900 feet of a major road, railroad, or airport, according to the US Environmental Protection Agency. The study, conducted by researchers at Tufts University School of Medicine and Boston University School of Public Health, used mobile labs to analyze the health impact of microscopic pollution on residents of Chinatown, Dorchester, and South Boston. The authors of the study, which will be published this week in the journal Environment International, said the accumulation of evidence in recent years linking prolonged exposure of ultrafine particles to cardiovascular risks should spur public officials, developers, and others to take action. Even relatively brief exposure — just months or days — can elevate health risks, they said. He and others called on developers of new properties to install advanced air filtration systems, and for transportation officials to consider installing decking over highways. Boston officials said they have been monitoring the new research on ultrafine particles, which include hydrocarbons and metals such as iron and nickel. “We’re concerned about any evidence that shows increased links between air pollution and health problems,” said Carl Spector, commissioner of the city’s Environment Department. He said the city is working to reduce traffic in Boston by discouraging commuters from driving alone and encouraging more residents to bike or drive low-emissions vehicles. But local activists are urging more aggressive action. Lowe said she worries about all the new construction in the area. “It’s a little bit ironic that so many luxury condos are going up right next to the highway,” she said. The main solution is better air filtration systems, architects and developers say. “The more we learn about the risks, the easier it is for us to convince our clients to install better filters,” said Chin Lin, an architect at HMFH Architects in Cambridge, which does work in Chinatown. John Fraser, a project manager for The Community Builders, which creates affordable and mixed income housing in the area, said he has incorporated Brugge’s recommendations into work he’s doing in Chinatown. At an old building they’re renovating on Chauncy Street, the organization has cleaned and resealed ducts, added new windows, and installed air-intake systems that filter twice as many particulates from the air as the previous system, he said. “This is what we could do to mitigate the risk,” he said. In the study, financed with a $2.5 million grant from the National Institutes of Health, researchers took blood samples and interviewed more than 400 people who live as close as a few hundred feet and more than a half mile from Interstate 93. They adjusted for age, gender, body fat, and whether someone smoked, among other factors. The researchers found that residents who lived within 1,500 feet of the highway were likely to have 14 percent more C-reactive protein in their blood than those who lived more than a half-mile away. Higher amounts of the protein indicate a higher likelihood of a stroke or heart attack. At Reggie Wong Memorial Park, Chinatown’s main outdoor recreation area, local officials are already planning changes to improve air quality. “This has to be the most unhealthy place in the city,” Lowe said. The changes will come after the state Department of Transportation, which owns the park, begins developing the land. The state plans to move the park to a nearby space, and Lowe and others have been holding workshops about how to design the new park with physical barriers and landscaping to make it safer. Proper barriers can deflect some of the pollution upward, dispersing it. Eng, the volleyball coach, is increasingly torn over whether to continue holding practice at the park. He has about 50 high school students who go there four days a week during the summer. “It’s very hard to bring a bunch of kids there, if it’s harmful to their health,” he said.